Coming soon to a TV/radio/polling station near you! Contrary to recent reports of his disappearance into the black heart of supremacist America the fedora wearing, self-appointed People’s Champion is about to make his comeback. Nigel Farage, for it is he, is seeking to reprise his most famous role, in Referendum I on 23rd June 2016. But why? I hear the incredulous ask. Did not our hero rise even further up the greasy pole and sup with the Donald? Has he not passed through the golden portals and achieved the ultimate firmament? Wouldn’t a return to smoking-free Blighty constitute a backward step in his trajectory? But no, our hero has never really been away. 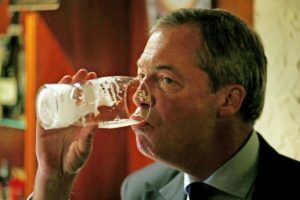 From 9th January 2017 he’s been presenting a radio show four nights a week – and one on Sundays – on LBC Radio (Leading Britain’s Conversation), though LBC’s Twitter feed acknowledges that, on many occasions, Nigel is not actually in the UK when he’s broadcasting. He’s much too important to deprive the wider globe of his presence. Perhaps he is contributing analysis to Fox News whose payroll he joined, on 20th January 2017. His idol, the Donald, was inaugurated POTUS on that very day! Imagine. Unfortunately his other friends who sought elected office have been less successful than MEP ( though sadly not MP ) Nigel. So Marine Le Pen didn’t get to the Elyseé, Norbert Hofer didn’t get to be Austrian President ( and, so ungratefully, announced that Nigel’s endorsement was unhelpful ) and most recently Roy Moore failed to be elected to the US Senate in Alabama. Other powerful friends, like Steve Bannon, have found themselves out in the cold and finance-less. Nigel too has claimed penury, in an interview with journalist Rachel Johnson, sister of fellow Brexiteer, Boris, when he said he was ’53, separated and skint’. But we know that he’s worth at least $4 million though he won’t, of course, publish his tax returns and who can blame him? This despite the shameful European Parliament docking his £90,000 a year wages by £35,000 to claw back funds they SAY were misspent. There’s the expensive townhouse, the anticipated EP pension of £73,000 a year, Fox News and LBC and those funds in the Isle of Man, which, he has confirmed is ‘not a tax haven’ though he was happy that ‘most forms of legal tax avoidance are okay‘. 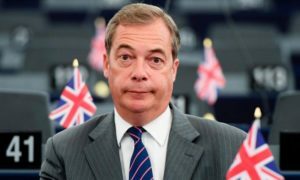 Take care, Nigel, the Isle of Man has signed up to the EU’s recent ruling on transparency and fair financial governance, better get that hard Brexit in place pronto. 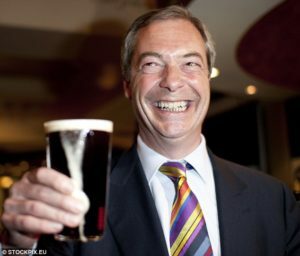 Since his finest hour Nigel has featured in a number of small, but profound, Farage productions, successfully campaigning for the changing of the colour of the British Passport, the return of the crown symbol on British beer glasses and being instrumental, along with his pals Bannon and Trump ( the POTUS, remember ) to the return of the bust of Churchill to the Oval office in the White House. But this is not enough for our selfless fighter for the public good. Nothing short of a full comeback will do. So we may thrill again to his dulcet estuarine tones telling us all what we the people want, while drinking a pint of bitter. And the starring role? NIGEL SAVES BREXIT in the new Referendum blockbuster! But wait! News just in from the US! 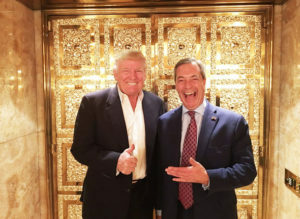 Testimony in the investigation into the link during the US election between Nigel’s pal the Donald and Russia has revealed that Nigel was, as ever, in the front line for democracy. Courier to the stars! Could this be a spoiler from a rival studio? Watch this space! This entry was posted in Political comment by juliej. Bookmark the permalink. Also loved his backtracking, later the same day, when he “clarified” that he didn’t actually say a second ref would be a good idea at all…..
A bit like the Brexiteers not having a bus with ‘£350m a week for the NHS’ written on its side.